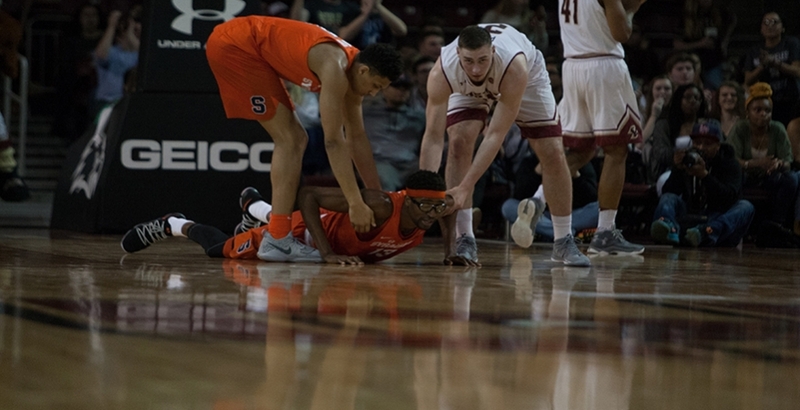 Paschal Chukwu is helped up during Syracuse's 85-70 loss to Boston College. 64 of Syracuse's 70 points were scored by three players. CHESTNUT HILL, Mass.--A lack of offensive distribution hurt the Syracuse men’s basketball team in its hunt for the NCAA Tournament with an 85-70 loss versus Boston College. The Orange (18-12, 7-10 ACC) needed to reveal its offense, which went missing in its previous game versus Duke University. With an opponent like Boston College (17-13, 7-10 ACC) they had the opportunity to do just that. It turned out, though, the offense still wasn’t capable of making plays. “The bottom line is we have three guys that are doing the scoring, and we don't have other guys that are capable of scoring,” Syracuse head coach Jim Boeheim said. Syracuse led the game with offensive aggression, something it lacked in its previous game versus Duke. On the opening possession, sophomore guard Tyus Battle grabbed an offensive rebound, which he dished out to junior playmaker Frank Howard who drained a 3-pointer to give the Orange an early lead. Boston College, coming off of a 79-78 heartbreak loss to Miami, made the crowd know who was the home team. Turnovers led to easy points for the Eagles. Then, sophomore guard Ky Bowman and junior guard Jordan Chatman drained threes to make it a 10-3 game. Battle was feeling it from beyond the arc, hitting back-to-back threes from similar positions off assists from Marek Dolezaj and Howard. “I was getting open shots, open threes, and open looks,” Battle said. It seemed like every shot the Orange were able to get, the Eagles were able to find. Ball distribution from Boston College led to a wide open Bowman elbow three. The Orange attempted to beat the physical Eagles defense using increased ball distribution and off-ball movement. Freshman forward Matthew Moyer had multiple touches outside the arc as he provided high ball screens for Howard and Battle. Down 13 points with under four minutes remaining, Syracuse kicked into a new gear on the offensive end. Oshae Brissett dribbled and drove to the basket, breaking through the defense and drawing fouls. Averaging 80.1 percent from the line, Brissett scored four straight points to make it an eight-point game, 34-26. The high zone led to Battle intercepting a pass, driving to the hoop, and then hitting a 3-pointer to make it a one-point game. Both teams traded points to close out the half, with the home team leading by three. “I thought we weathered that and came back and got our offense going,” Boeheim said. The second half saw Boston College grow separation from the tiring Syracuse offense. An opening three from Chatman increased the lead to 43-37. With the offense relying on Battle, Brissett, and Howard, the Eagles defense knew to put increased pressure on them, preventing them from getting many open looks. A pair of threes from Battle and Brissett were Syracuse’s only points from beyond the arc in the first ten minutes of the half, with junior center Paschal Chukwu throwing down a put-back dunk between those. Syracuse couldn’t make it a two-possession game at that point, which prevented the chance of any comeback. Meanwhile, BC’s trio of Bowman, Robinson and Chatman had various opportunities to score points in different ways. More Eagles willing to shoot and create their own chances. Freshman forward Steffon Mitchell had chances down by the rim and Nik Popovic drew fouls, sending him to the line for free throws. In contrast, the role players of the Syracuse team (Moyer, Dolezaj, Chukwu and Bourama Sidibe) took four shots leading to six points. Boeheim touched on this multiple times for leading to offensive problems. "Their knees...they just can't jump," Boeheim said. In the final seven minutes of the game, the only field goal the Orange scored was off a Howard 3-pointer. The other 10 points came from the line. This provided separation for BC as their lead increased. "We just let them hit way too many threes," Battle said. With less than a minute remaining, Boston College led 82-70. Freshman forward Luka Kraljevic began to dribble out the clock. As the shot clock expired, he threw up a three that splashed through the net, adding insult to injury with Syracuse’s loss. This was the Eagles’ 14th three-pointer of the game. “They're good shooters, they had 11 in Syracuse,” Boeheim said of their January matchup. Syracuse plays its final game versus 16th-ranked Clemson on March 3 in the Carrier Dome.